Once again, on the occasion of the cosmopolitan Milan Design Week 2018, Seletti and Studio Job join forces to enrich their brand BLOW with a new product. BLOW is a family of objects with a total "pop" design mood funded last year as a real design brand by the will of Stefano Seletti, Job Smeets and Nynke Tynagel: a project that points to that idea of democratic design that has always distinguished Seletti. 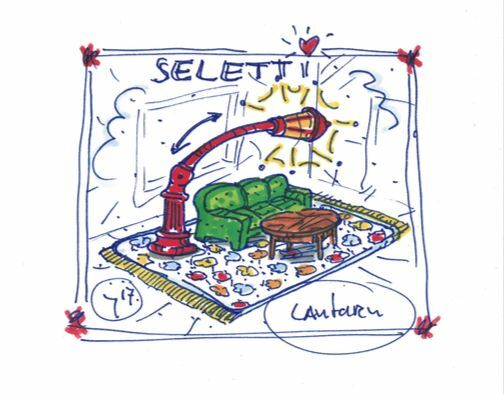 On show at the Salone del Mobile in Rho Fiera and at the Seletti Flagship Store in Corso Garibaldi, the new lamp Cora with its unique “street style” and a hit of “cartoon” mood. Cora is the epitome of the old street lamps, the gas lights which could be found in the streets at the beginning of the 20th century. Studio Job reinterprets the aesthetics of these memorable street furniture to make it suitable for the contemporary homes.